Customers are various and that is the reason you should approach them differently. 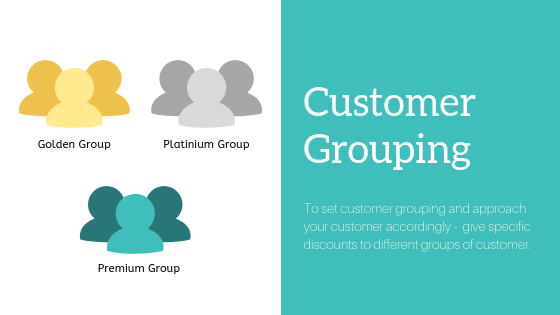 Customer Grouping is a tool for you to categorize your customer and approach them accordingly. Creating a group and adding customer to the group are main steps to use this feature. Specific discount by category and product are additional functions. If specific discount is specified, any product fall under this will take specified discount instead of initial discount. **This feature only available for webShaper bizStore package. Insert Group Name, Discount and Apply On which product discount. 2. Add Customer to the group. Assign customers to their group using email. Delete customer from the group. 3. Setting specific discount by category. Note:Every products in the category will take this discount instead of the discount you specified. Manage Specific Discount by Category from drop down list. Put discount percentage for each category. 4. Setting specific discount by product. Note: Every products specified in this section will take price from here and ignore both discounts you specified. Manage Specific Discount by Product from drop down list. Insert SKU / Product Name, or leave it blank to display all. Put in selling price on Member Price column. Tick on all products that you have made changes. Groups of customers to set target pricing. For more information, checkout our tutorial page to Manage Customer Grouping.